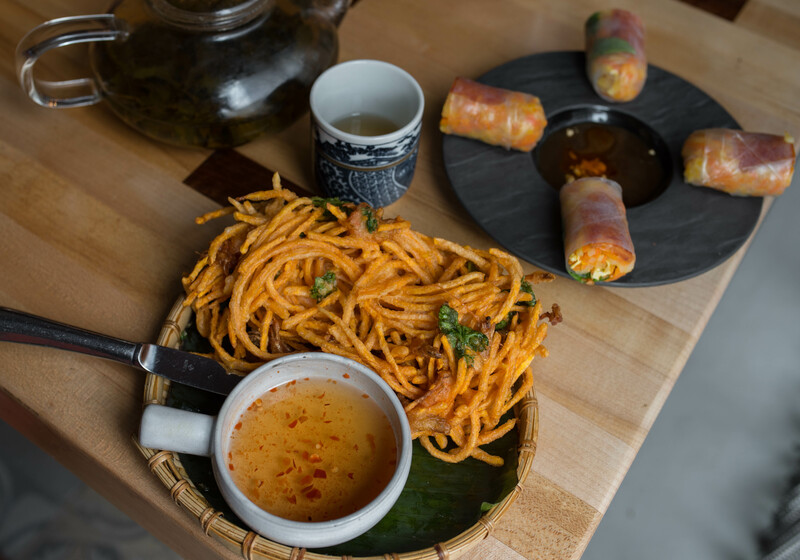 If you’re in the mood for some seriously delish Vietnamese food, Sunday in Saigon is an absolute must-try. Located on 682 N St. Asaph St in Old Town Alexandria, they’re open from Tuesday-Thursday from 11:30-2:30 & 5-10:30, Friday from 11:30-2:30 & 5-11:30, Saturday from 11-11, and Sunday from 11-10. Everything from service to interior is on point, and their food is second to none. They’re perfect for any and every occasion, whether you’re looking to impress someone on a date or just want to have an incredible meal with friends and family. We can pretty much guarantee that everyone will leave full and totally impressed. We dined there for lunch the other day and got various different dishes to sample and share. We started our meal off with two appetizers that blew us away: their Banh Tom Co Ngu ($7) and their Bo Bia ($7). The former’s a shrimp and sweet potato fritter that was cooked to absolute perfection. This appetizer was out of this world, and we can’t recommend it enough – in fact, we’re drooling just thinking about it! It was served with fish sauce so remember to get your dip on. 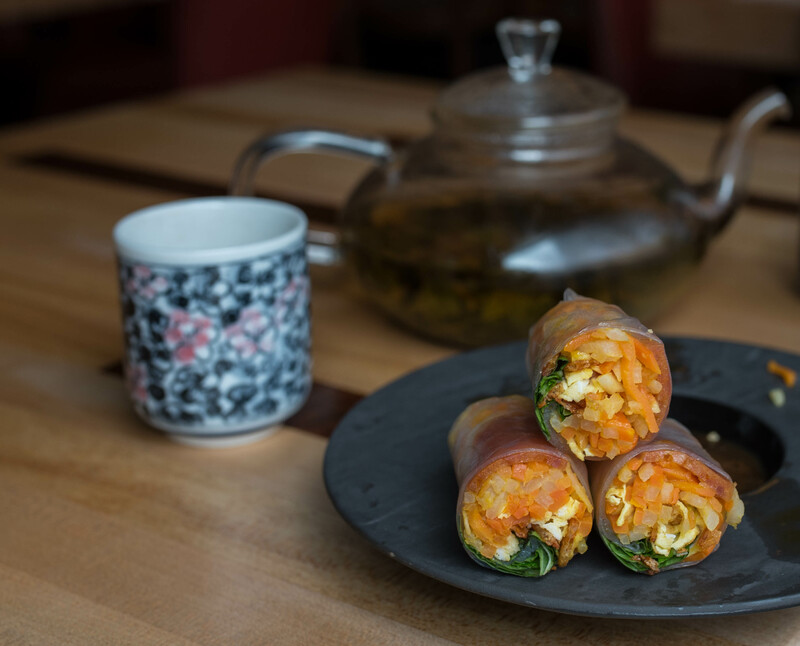 The Bo Bia (aka the summer rolls pictured above the magical sweet potato fritter) contained egg, jicama, bean sauce and Chinese Sausage & shrimp – if you’re a vegetarian, you can get it with tofu. The texture was incredible – we really loved the chewiness of the rice wrapper, and it was hands down, one of the best summer roll we’ve ever had. For those of you interested, they have other rolls available so you can always try something else if you want. Then came our entrees, and they were almost too beautiful to eat. 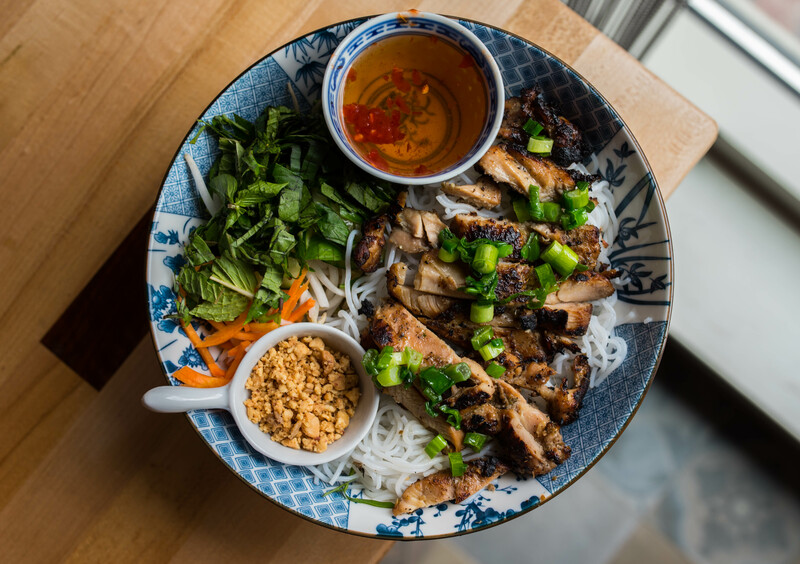 This is their Bun Ga Nuong ($12), and it’s grilled lemongrass coconut chicken with pickled daikon & carrot, romaine lettuce and rice vermicelli, topped with fish sauce and peanuts. Mix everything together to enjoy all the different flavors you have in your bowl, and don’t be afraid to use your fish sauce. The noodle bowl WILL taste good with or without it, but the sauce really brings everything together in the best way possible. Yes, it’s strong, but we personally LOVE fish sauce and want it with everything! 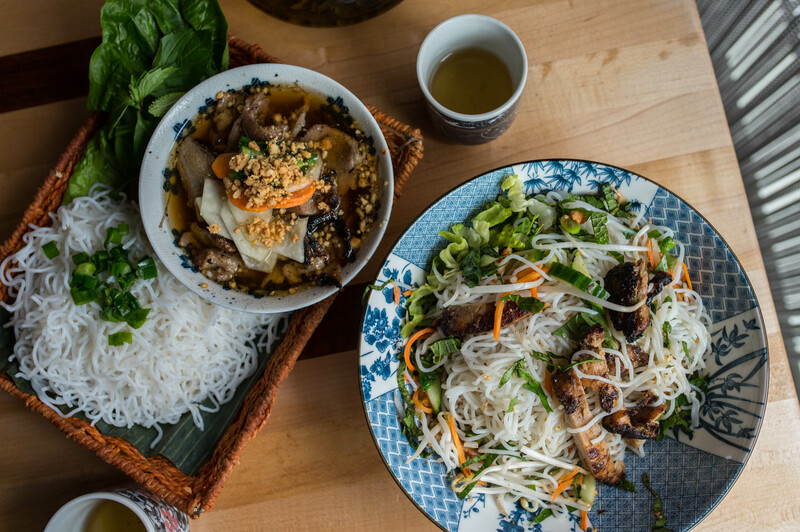 Our second favorite lunch entree was their Bun Cha Ha Noi ($14), and it’s pictured above the Bun Ga Nuong. It’s grilled pork belly, pork patty, pickled papaya, carrots, and vermicelli. Perfectly cooked noodles with tender, flavorful pork? Um, yes please. Don’t mix the noodles together with the “broth.” We recommend dipping or just mixing a bit in at a time. Anddd last but not least, their Pho Dumplings. These babies are only available during brunch, but we were lucky enough to try them. 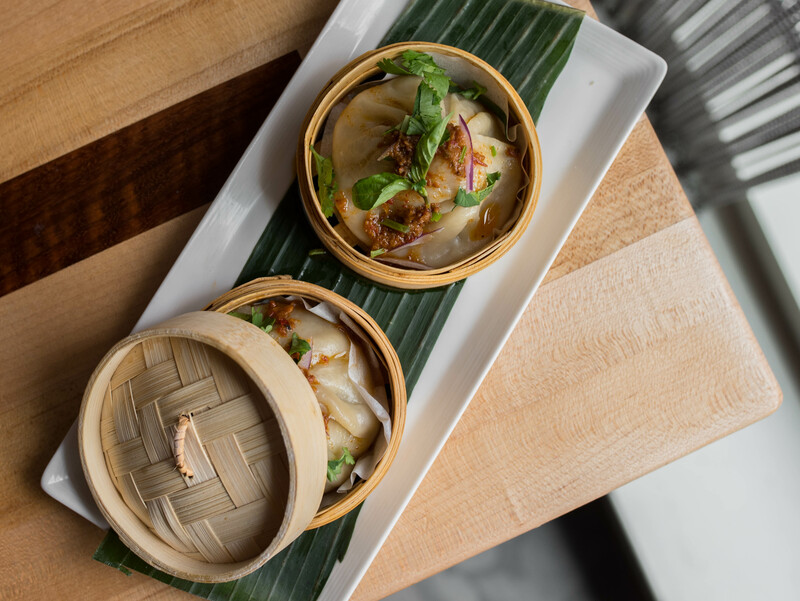 They contain flank steak and brisket in a house sate sauce, and they’re a clever play on Chinese soup dumplings. These alone are worth a trip to Old Town, like we’re not kidding. Once you try these babies for yourself, you won’t be able to stop coming soooo we’re sorry for bankrupting you in advance, ha. If you end up coming for brunch, they have a really cool AYCE deal. For $38, you get unlimited small places and 5 cent brunch drinks, but everyone at your table has to indulge! The menu looks ridiculous though so we recommend splurging. We’re definitely planning on going back because everything looks so dang good, including their cocktail menu! And one FINAL thing before we leave you guys today, they have a bamf lunch special that you should definitely take advantage of so make a note! It’s a pick two kind of deal for $12, and you get to choose from a salad, rolls, banh mi and pho (!!!!!) So, how many of you guys like Vietnamese food? Have you tried any of the dishes we talked about today? Definitely let us know by leaving a comment below, and remember to check back Thursday for fresh new content. For more VA foodporn, click here! Until next time, Nomsters.